By LTC Thomas Morgan, USA-Ret. The early years of Dwight D. Eisenhower’s service in the Army are less well known than his service in World War II and the years following the war. These early years in the Army laid a solid foundation for his rise to high command and leadership in World War II, but Eisenhower sometimes agonized that his military career was not progressing well. However, his ambition, professional competence, and the mentoring by the best officers in the Army made him a “comer” in the peacetime army during those the years between World War I and World War II. During those years, Eisenhower was sorely tested and strengthened by adversity. These trials and tribulations, however, prepared him for the awesome responsibilities that he assumed during World War II. 1920 was not a good year for 30-year old CPT Dwight D. Eisenhower, Infantry (Tanks). Frustrated at not being sent to France during World War I, he had trained troops instead at Fort Ogelthorpe, Georgia; Fort Leavenworth, Kansas; Camp Meade, Maryland; and Camp Colt, Pennsylvania. During this period, Eisenhower quickly earned the reputation of being an extremely capable young officer. He had volunteered for combat, but his instructional and organizational abilities had made him invaluable to the mobilization effort back in the United States. In November 1918, he finally received orders to lead a tank battalion to Europe. The Armistice of 11 November 1918, however, ended the war and his hopes for leadership in combat. The war concluded with Eisenhower holding the temporary rank of lieutenant colonel, only three years after graduating from West Point in 1915 (the “Class the Stars Fell On”). Since he had not experienced combat in World War I, he thought his career was over, although he had performed well in the stateside training environment. After the war, in 1919, Eisenhower reverted to his permanent rank of captain. One event after World War I that made a lasting impression on Eisenhower was his participation in the 1919 Transcontinental Motor Convoy. Eisenhower traveled as an official observer for the Tank Corps with an Army convoy of 72 military vehicles and about 280 officers and enlisted men. It began at “zero milestone” on the South Lawn of the White House and ended two months later at San Francisco. The Army’s objectives for this ambitious undertaking were to support the building of transcontinental roads so necessary for national defense, to encourage enlistment in the Army’s Mechanical Training Schools, to demonstrate motor vehicles for military purposes, and to test military vehicles on a wide variety of physical terrain. The convoy even brought along a light Renault tank to test the primitive roads from Washington, DC, to San Francisco. This trip was largely the inspiration for the modern interstate highway system sponsored by the administration of President Eisenhower more than thirty years later. In 1920, Eisenhower was back at Camp Meade as the second-in-command of the 305th Tank Brigade. His friendship with Major George S. Patton, commander of the 304th Tank Brigade, stems from that period. Although temperamentally different, they shared a professional interest in the profession of arms. Dwight “Ike” Eisenhower and George “Georgie” Patton developed and tested tank theories. In many ways they shared a passionate hope for the future of tank warfare, and they both published articles in professional military journals about their beliefs. Patton, wealthy and friends with several influential individuals within Army circles (including Secretary of War Newton D. Baker), had fewer problems with his innovative writings than those experienced by Eisenhower. Patton went off to rejoin the Cavalry rather than be reassigned to the Infantry when the 1920 National Defense Act did away with the Tank Corps and placed tanks under the Infantry branch. Eisenhower’s writings in the Infantry Journal found disfavor with the Chief of Infantry, MG Charles S. Farnsworth, who told young Eisenhower that his ideas were wrong and dangerous. Farnsworth added that if he published anything further incompatible with “solid Infantry doctrine,” he would be hauled before a court-martial. One may remember that during the same interwar era, the Army attempted to stifle BG Billy Mitchell’s revolutionary ideas on airpower. Unlike Eisenhower, however, the Army court-martialed Mitchell for insubordination and brought an end to his distinguished military career. Fortunately for the young Eisenhower, he was a skilled writer. English had been one of his best subjects at West Point, and even as a plebe, he could dash off his English themes in thirty minutes while his roommate required several hours to complete his assignments. Eisenhower’s article in the November 1920 Infantry Journal was innocuously titled “A Tank Discussion.” While professionally written, it did not necessarily mark the writer as the future leader of the Great Crusade in Europe during World War II. 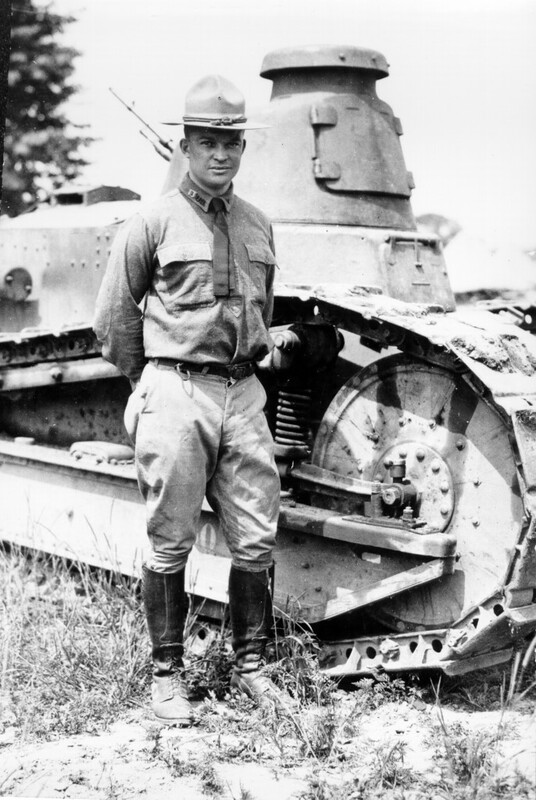 In the article, Eisenhower candidly discussed the advantages and disadvantages of the tank as seen during World War I. The ability of tanks to cross obstacles such as trenches, ditches, and streams was important for an infantry support vehicle. Eisenhower mentioned the faults of the existing U.S. Mark VIII heavy tanks and French-built Renault light tanks. He went on describe a more desirable tank that could well have been the requirement specifications for the American M4 Sherman tank of World War II. He was quick to grasp the mechanical problems of the current tanks and expressed optimism that those problems could be overcome by modern technology. After his run-in with the Chief of Infantry, Eisenhower’s fortunes did not improve. Late in 1920, the Eisenhower’s firstborn son, three-year-old Doud Dwight, nicknamed “Ikky,” caught scarlet fever and died. Later another crisis occurred. Eisenhower had erroneously received $250.67 in child support while Ikky was staying with an aunt in Iowa. Eisenhower identified the error himself, but the matter was pursued by the Inspector General’s office for several months and Ike was threatened with discharge. In the meantime, Eisenhower had been invited by BG Fox Conner to join him on his staff in Panama. Eisenhower had met Conner, who was known as one of the Army’s intellectuals, in George Patton’s quarters at Camp Meade. Conner had been very impressed with both Patton and Eisenhower as they explained to him their training, wargames, and theories relating to tank warfare. Conner eventually intervened on Eisenhower’s behalf with the Inspector General, and all charges of financial impropriety were soon dropped. Shortly after his legal troubles ended, Eisenhower was on his way to Panama to join Conner’s staff. Thus, this significant change in Eisenhower’s life, what he later called the “Tragic Road to Panama,” ushered in a new chapter of his career, and the tank crusade was left to be kept alive by others for the time being. It is interesting to note that the Infantry in 1925 saw tanks in a better light. The November 1925 issue of Infantry Journal contained an article entitled “The Development of Tanks” by MAJ John W. Leonard, Infantry. This article acknowledged technological improvements in the new tanks being developed for the Infantry. It was endorsed favorably by BG Samuel D. Rockenbach, former Chief of the Tank Corps and Commandant of the Tank School. Leonard, a West Point classmate of Eisenhower’s, would go on to command the 9th Armored Division in World War II and retire as a lieutenant general. By 1927, the mechanization of military forces had become a popular topic of military discussion. The Infantry Journal was firmly on the side of tanks when it published a series of articles by CPT George Rarey, Infantry (Tanks) about tanks in the Great War. Eisenhower was more careful and politic in his future writings. He probably “ghost wrote” some articles in an April 1925 Infantry Journal edition devoted to military duty in Panama. He also wrote an article for the June 1927 Infantry Journal entitled “The Leavenworth Course,” signing himself as “A Young Graduate.” Finishing first in his class at Fort Leavenworth in 1926 made him eminently qualified to write about it. In the article, he described the course as “…a year which should be one of the most enjoyable, and in many ways the finest of an officer’s peacetime service.” This may have been one of the origins of the saying that Leavenworth is “the best year of your life.” Eisenhower later wrote a guidebook to World War I battlefields for retired GEN John J. Pershing, who was then the chairman of the American Battle Monuments Commission (ABMC). He also wrote speeches and papers for Pershing and first met George C. Marshall, who had served as Pershing’s aide when he has Chief of Staff of the Army. History records little of the Chief of Infantry who almost squashed Eisenhower’s career. Eisenhower’s work for Pershing had its rewards because he was able to go to France for a year to continue work on the ABMC guidebook. He absorbed a detailed knowledge of the topography of the French countryside, the road and railroad systems, and the French people and their culture. All of this would be invaluable to him later as Supreme Allied Commander during World War II, and as the first Supreme Allied Commander Europe (SACEUR) during the early years of the Cold War. Upon his return to the United States, he was assigned to the Office of the Assistant Secretary of War where he developed plans to mobilize American industry in the event of war. Eisenhower then worked closely as an aide to Army Chief of Staff General Douglas MacArthur, who considered Eisenhower the best young officer in the Army at that time. He later followed MacArthur to the Philippine Islands in 1935 when MacArthur became military advisor to the Philippines. At this point, Eisenhower and the tank seem to have finally parted ways, and others were left to rally support for the tank. Eisenhower’s Camp Meade friend George Patton, along with a host of others, eventually wrote the book on tank warfare in Europe during World War II. Both before and at the immediate beginning of World War II, Eisenhower seemed to revert to his World War I role as a training officer. He served as chief of staff of LTG General Walter Krueger’s Third Army during the Louisiana Maneuvers and authored the winning battle plan for the exercises, the largest in U.S. Army history, but remained a relative unknown. In a photo taken of him with Krueger and other staff officers, he was identified as “Lt. Col. D. D. Ersenbeing.” Nevertheless, while not yet recognized as a national military figure, Eisenhower was well known within the ranks of the Regular Army. He had worked for some of the most famous and respected general officers of the pre-World War II era. GEN Pershing and GEN MacArthur had considered him the best and most promising officer that they knew. Their efficiency reports on Eisenhower testifying to this are on display at the Eisenhower Library in Abilene, Kansas. It was Pershing who recommended Eisenhower to Marshall and he became known as “Marshall’s protege.” He became the principal War Department planner as General Marshall’s chief of the War Plans Division at the beginning of World War II. In that position, he played a key role in the developing the Allied strategy that led to the eventual defeat of Nazi Germany. After America entered the war in late 1941, Eisenhower showed his prowess as a military leader by overseeing Allied military operations in North Africa, Sicily, and Italy in 1942-43, and during the Allied invasion of Western Europe beginning in June 1944. By the time of the great German offensive through the Ardennes in December 1944 that created a large salient, or bulge, in the Allied lines, Eisenhower commanded the Allied forces in the European Theater of Operations as a five-star general. The resulting Battle of the Bulge gave Eisenhower a chance to demonstrate his knowledge of tank warfare and the doctrine of how best to contain and reduce an enemy salient. Army service schools during the period between the World Wars had taught that the shoulders of a salient must be firmly held before its reduction by counterattack. Eisenhower had been a good student and knew the doctrine well. The old Leavenworth solution paid off. 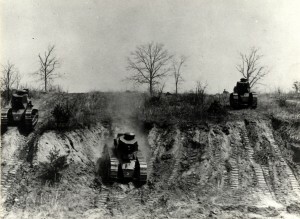 Because of his assignments with tanks during and immediately after World War I, and his experience gained from the Louisiana Maneuvers, few officers could match his familiarity with armor and the tactics of mechanized warfare. He ordered American and British armored units from north and south of the Bulge to reinforce the shoulders. He brought reinforcements from Great Britain and committed his strategic reserve of two US airborne divisions, the 82d and 101st Airborne Divisions. He ordered the Communications Zone combed for replacements to fill vacancies in the ranks of combat units depleted in battle. He motivated his subordinates, especially his old Camp Meade friend George Patton, now a lieutenant general commanding the U.S. Third Army, to go on an immediate offensive with a heavily armored force that rallied the Allies and rebuilt their shattered morale. In a campaign after the Bulge, Eisenhower again showed that he recognized the importance of an armored force to exploit a key situation. At the end of the Third Army’s successful Eiffel Campaign, Patton needed a fresh armored division to penetrate the Saar-Mosel Triangle and capture the city of Trier. Patton asked Eisenhower for the use of the 10th Armored Division, part of the Supreme Commander’s strategic reserve. Eisenhower approved Patton’s request. The rapid capture of Trier marked the start of Patton’s highly successful Palatinate Campaign, one of his best conducted military actions of the war and one where he really “earned his pay.” Once again Eisenhower’s knowledge of tanks helped gain a victory in what was considered by many, including the Germans, as one of the finest campaigns of the war. During World War II, Eisenhower became the epitome of a coalition commander–calm, in control, and optimistic. The dark days of 1920 and the uncertainty of the future of the Tank Corps, and his Army career, were over. He had learned from adversity and his own determination over the years. He had developed his organizational and leadership skills by working for the best officers in the Army. As a result, he ably led the largest American armies assembled in U.S. military history. It was his finest hour as a commander. Thus, the active involvement in direct combat and tank warfare for which he craved so much in 1917-18 when training the fledgling Tank Corps eluded Eisenhower again in World War II. However, of all the field commanders in World War II, Eisenhower had the most complex unified and allied command. He had survived four long years of tough mental and physical training at West Point. He had displayed reserves of character and strength during his military career that would one day emerge when they were most needed. That day came in World War II. Therefore, the bitterness of missing combat in World War I, and his personal troubles in 1920, were largely alleviated because he had the biggest prize of all, the Supreme Command of the entire European Theater of Operations. All of his achievements then culminated when, as Supreme Allied Commander, he earned the honor of accepting the surrender of the German Army at Reims, France, on 7 May 1945.